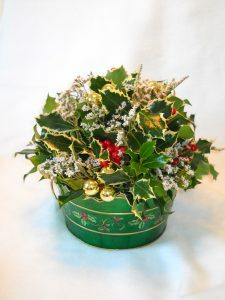 Fresh holly is an elegant and traditional winter decoration. 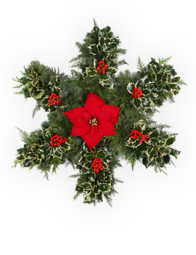 It is glorious when made into holiday wreaths and Christmas centerpieces, or can be used by itself to accent a room with holiday cheer. The fresh greenery is hearty and long lasting, and the glossy green leaves are versatile and attractive. Through the ages holly has remained a beloved and classic holiday decoration. Mill Creek Holly Farms produces both the distinctive Silver Variegated holly, and the classic English Green holly. 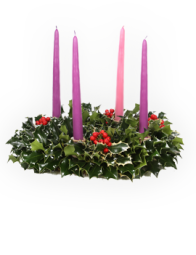 It can be purchased in ready-made wreaths, garlands, swags, and centerpieces, or in holly boxes that make great gifts. Get ready for the holidays – Order this seasonal favorite today! 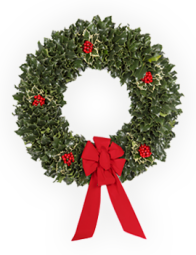 Hand-tied green holly and variegated wreaths, accented with natural red berry clusters, each includes a large red accent bow. Festive holiday accents created from noble fir, both green holly and variegated holly, red berries and other special holiday accents. Adorn your mantel, entry table, or front door. Honor the memory of loved ones, and keep traditions like kissing under the mistletoe. 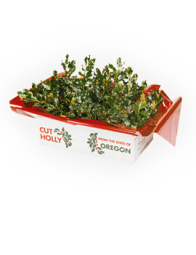 Send a distinctive gift box filled with fresh Silver, English Green, Variegated or mixed Holly with a special bonus: Oregon Mistletoe. This was an excellent experience. My holly wreath arrived promptly and in great shape. I enjoyed it for the entire Christmas season. Mill Creek Holly will definitely get my business again next year. I received your shipment of holly today…. When I opened the box I found the most beautiful boughs of holly I’ve ever seen. I am 77 years old and I enjoy Christmas as I did in my youth. Your holly is breathtakingly beautiful. I feel very fortunate to have found you on the net. I appreciate your effort to grow this beautiful holly. Many thanks! I really appreciate the great service! The box of holly arrived this afternoon. The holly was in A-1 condition. You must do a good job of packaging it. Thank you, thank you for being so conscientious about keeping me informed and for taking the time out to track the boxes for me. I really appreciate it. Mill Creek Holly Farms is the only place to buy holly and greens. I always buy for myself and as gifts for others – they never disappoint. I love that it is a family business.